Today, past, future. 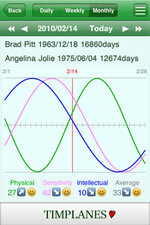 Biorhythm in your life. BioAffinity is biorhythm tracking app. - Management of multiple profiles and synastry. - Change term by daily, weekly, monthly. - Jump to Today, or day you want to know. Profile List Tap + button to add new profile. Profile Setting input profile or import from list. Biorhythm well, ok, fine day. Check by Date! Check Positive, Negative, Need to care Days.